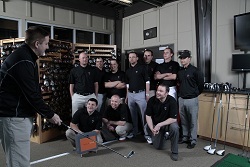 Our staff of RYG™ Certified Professionals are all career golf professionals. It is mandatory for all of our clubfitting and teaching professionals to participate in continuing education in four distinct areas: (1) Clubfitting (2) Golf Instruction (3) Customer Service Training and (4) Technology. All RedTail Clubfitters and Teaching Pros must complete their initial training and certification prior to performing a single custom fitting or lesson. Moreover, all RYG™ Pros attend continuing education classes on a regular basis. We hold weekly forums and classroom style lectures to insure our Professional Staff is up-to-date on the latest technology, industry information and equipment. None of our team members work on commission. All of our Certified Professionals are salaried employees. They are charged with one singular objective, "provide the highest level of customer service!" We purposely do not work on any kind of commission because we want our staff to be motivated only by the customer's best interest. We also emphasize a team-oriented approach to our operation. A single customer may visit our facility numerous times before purchasing anything from our shop. We do not want this customer to feel any sales pressure or obligation to ask for a specific team member. Our staff of RYG™ Certified Professionals are focused on only one objective: providing the highest level of customer service!